TUESDAY FEBRUARY 5 (Stone Ridge, NY) – Just when it seemed like the Westchester Community College Men’s Basketball was positioned for their most crushing defeat of the 2018-19 season, Westchester stole victory from the jaws of defeat, and in the process scored a win that was as important as it was unexpected. Four Vikings scored in double figures, including a 23-point night from sophomore Miles Haughton (Mamaroneck, NY/Mamaroneck HS) as the Westchester Community College Men’s Basketball earned its third straight win, 85-82 over Ulster Community College on Tuesday night at Ulster. With the win, the Vikings are now 14-7 overall and 3-2 in Region XV play. Unlike their 23-point win over Ulster on Dec. 4 during which Westchester cruised from start-to-finish, Westchester had to fight every minute to win on Tuesday night, trailing 38-36 at halftime before a disastrous start to the second half saw the Vikings fall behind by as many as 19 points, 75-56 with 7:15 to play. However, from there, Westchester went on an incredible 26-7 run to tie the game at 82 with 46 seconds remaining. The key play was as the Vikings trailed by eight points with 1:40 to play; Haughton hit a three-pointer to bring WCC to within three points. Immediately after the basket Ulster received a technical foul, for which Westchester hit both free throws to make it a one-point game. Westchester scored on the ensuing possession to take the lead, and Jon Brennen (Irvington, NY/Iona Prep) enjoyed some heroics at the free throw line to give WCC a cushion. A last second desperation heave by Ulster to tie the game fell short, and Westchester celebrated its most exciting win of the season. Sophomore Monte Lambert (Brooklyn, NY/James Madison HS) scored 13 points, while freshmen Joe Zayer (West Nyack, NY/Clarkstown South HS) and Robert Pope (Bronx, NY/Lehman HS) added 10 points apiece. THURSDAY FEBRUARY 7 (Valhalla, NY) – When the Orange Community College Men’s Basketball team defeated Westchester Community College on Dec. 6, it was considered a significant upset in Region XV play. However, heading into Thursday night’s tilt at Westchester CC between the two teams, the Vikings were literally a different team. On Dec. 6, Westchester CC did not have Monte Lambert (Brooklyn, NY/James Madison HS) in the line-up. On Feb. 2, they did. The difference was beyond noticeable during a 101-85 win for the Vikings as Lambert scored 28 points – 19 coming during the second half – to go with six rebounds and three assists. With the win, Westchester improves to 15-7 overall, 3-2 in Region XV play. Orange (10-12, 2-3 Region XV) scored the game’s opening basket only seven seconds in, but from there, Westchester scored five straight points, and never looked back, holding the lead for the final 39:53 en route to their fourth consecutive win. Westchester held a 21-20 lead with 10:52 to play in the first half, but a Miles Haughton (Mamaroneck, NY/Mamaroneck HS) three-pointer extended the lead to 24-20, and Westchester ultimately went on a 15-4 run to put some distance between the teams. A Joe Zayer (West Nyack, NY/Clarkstown South HS) three pointer with 3:11 to play in the first half gave the Vikings a 46-31 lead, and Westchester CC took a 56-46 lead into halftime. Orange did not go down quietly as the Colts made several second half runs, including one that made it an 89-84 game with 3:22 to play. However, the Vikings finished the game on an 11-2 run to put things away. Haughton finished the game with 30 points – 18 of which came during the first half – to go with eight rebounds and three assists, while Zayer had 17 points – 15 coming during the first half – and a team-high five assists. Westchester shot 49% – compared with a 35% night for Orange – and out rebounded the Colts 54-42. 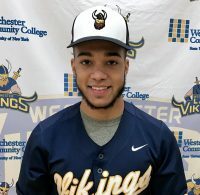 (Valhalla, NY) – For the second time during the 2018-19 season, Westchester Community College sophomore Miles Haughton (Mamaroneck, NY/Mamaroneck HS) is named the Mid-Hudson Conference Athlete of the Week. This time around, Haughton earned the honor after leading the Vikings to a 2-0 stretch during which the Vikings earned two crucial Mid-Hudson Conference wins. Against Ulster Community College on Tuesday, Feb. 5, the Vikings trailed the host Senators, 75-56 with 7:15 to play in the second half. Haughton led Westchester CC on an incredible run, outscoring Ulster 26-7 down the stretch to earn an improbable 85-82 win. Haughton was instrumental in the WCC comeback, scoring 23 points on 8 for 11 shooting, while adding eight rebounds and two assists, including a huge three-pointer with 1:40 to play to put the Vikings within striking distance. Two days later, Haughton scored 30 points – on 7 for 11 shooting from the floor – and added eight rebounds and three assists as Westchester CC avenged an early-season defeat to Orange Community College, with a 101-86 win over the Colts in Viking Gymnasium. For the week, Haughton averaged 26.5 points per game, while shooting an incredible 68% from the floor (15 for 22), 70% from three-point range (7 for 10), and 89% (16 for 18) from the free throw line. For the 2018-19 season, Haughton is averaging a team-leading 20 points per game, while also contributing 6.5 rebounds per tilt, and he added 57 assists, 41 steals, and a team-high 34-blocked shots. SATURDAY JANUARY 26 AND SATURDAY FEBRUARY 9 (Babylon, NY) – Freshman Matthew Rush (Valhalla, NY/Valhalla HS) and freshman Edward Aiken (Middletown, NY/Pine Bush HS) tied for fifth place in All Events to secure a place on the All-Tournament team. The Westchester Community College Men’s Bowling team secured a fourth place finish at the Suffolk Tournament on Saturday, Feb. 9 in West Babylon, NY. Both rookies averaged a 174 during the day, with Rush bowling a 227 during the final game of the day, which was the third best individual performance among all bowlers on Saturday. Aiken continued his strong campaign with a 220 during the third game, which was the fourth best single-game performance for the day. Also for the WCC Men’s team, sophomore Matthew Rice (Lagrangeville, NY/Arlington HS) finished 10th with a 172 average, which was only 14 pins behind a spot on the All-Tournament team. On the women’s side, freshman Brianna Kara (Shrub Oak, NY/Lakeland HS) finished in 19th place with a 131 average. (Stone Ridge, NY) – Over the course of any sports season, it is almost a given that a short campaign comes complete with long memories. Such was the story on Tuesday night at Ulster Community College as the Westchester Community College Women’s Basketball team turned a rivalry with SUNY Ulster that provided nothing but nightmares only 63 days ago into an evening the Vikings will never forget. Four Vikings scored in double figures, including a huge night for freshman Jada Tom (Elmsford, NY/Alexander Hamilton HS), as Westchester CC stunned Region XV powerhouse Ulster, 79-42. With their second consecutive win, Westchester improves to 4-3 for the 2018-2019 season. 63 days after falling 56-29 to the Senators at home, Westchester opened Tuesday’s game on an 8-2 run, and never looked back. Westchester led 42-22 at halftime, and broke 75 points for the third time this season. Every Viking scored at least five points as Tom had 15 points and four steals, while Jewelle McEwan (Bronx, NY/Harry S. Truman HS) with a 16-point, 11-rebound double-double. Also for the Vikings, Shanaya Jones (Bronx, NY/Health Opportunities HS) had one of the finest games of her career with 12 points, eight rebounds, eight assists, and eight steals. Paige Collins (Jamaica, NY/Wadleigh HS) added a double double of her own with 11 points and 12 rebounds.